Here’s a fun and easy Earth Day craft for kids! This painting technique is really cool and virtually mess-free, but it still provides kids with a great sensory experience. The results look great too! This earth craft really does look like the planet Earth! 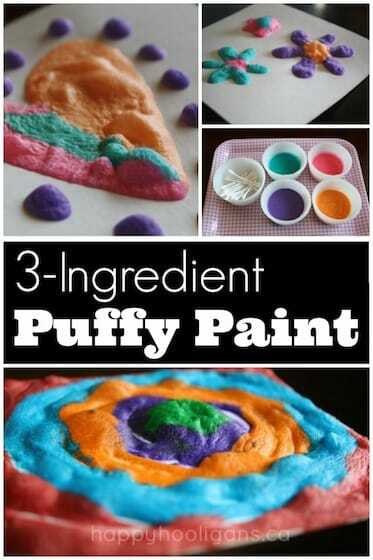 When I was thinking up Earth Day crafts to make with the hooligans, smoosh-painting came to mind. Kids just love smoosh-painting! Smoosh painting is such a fun process, and seeing the paint colours blend together never gets old. 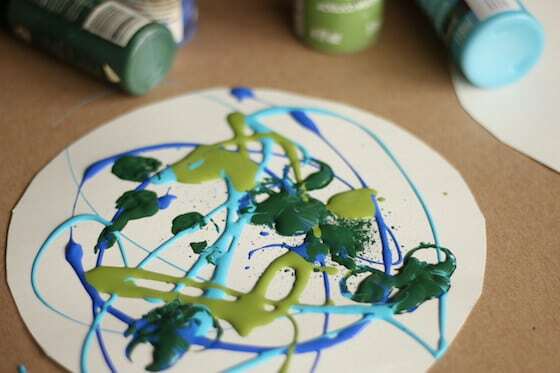 If your kids love getting creative, but you hate the mess of paint, you’ll love this mess-free art technique. It’s an easy-set up art activity that’s a breeze to clean up too! 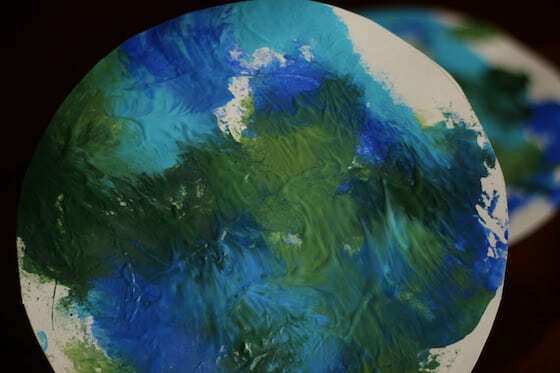 Making an Earth Day craft presents a great opportunity to talk to your toddlers and preschoolers about the importance of taking care of our planet. When we’re making our Earth Day crafts here in my daycare, I like to ask the kids to think of all the things here that help to keep our earth clean and healthy. We talk about how we recycle and compost, how we make our own homemade laundry detergent which is free from the harsh chemicals found in commercial detergents. We clean with baking soda and vinegar, and use cloth towels instead of paper towels, and glass containers instead of plastic. 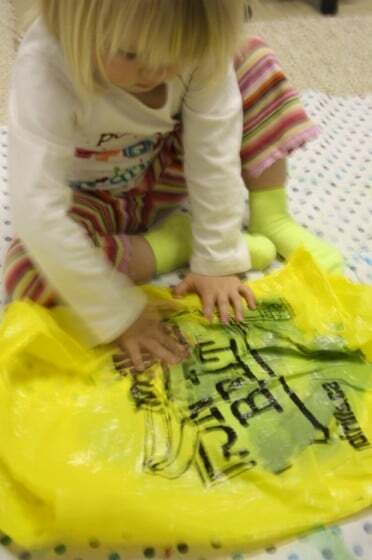 I point out how we often use our recyclables for crafting, and how we re-purpose our old jeans into aprons and bibs for the daycare. It’s good to point these things out to the children because while they know we do these things, they don’t always realize why we do them, or how we help our planet when we do. Ok, on to the smoosh painting! We’ve done smoosh painting before to create a beautiful piece of collaborative artwork for our playroom, and also when we made our gorgeous fall collages. To begin, I cut circles out of a large piece of white cardboard. 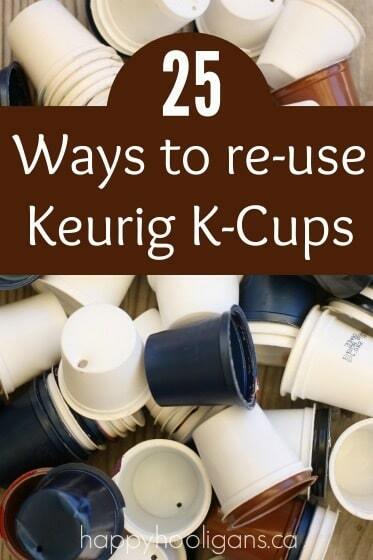 If you don’t have cardboard, you could use paper plates or poster board. Next comes the paint. We used to shades of green and two shades of blue paint for this project. Have your kids drizzle or blob a little of each colour all over their cardboard. You don’t need a ton, but you want enough that they’ll be able to really smoosh it around. Here comes the fun part! 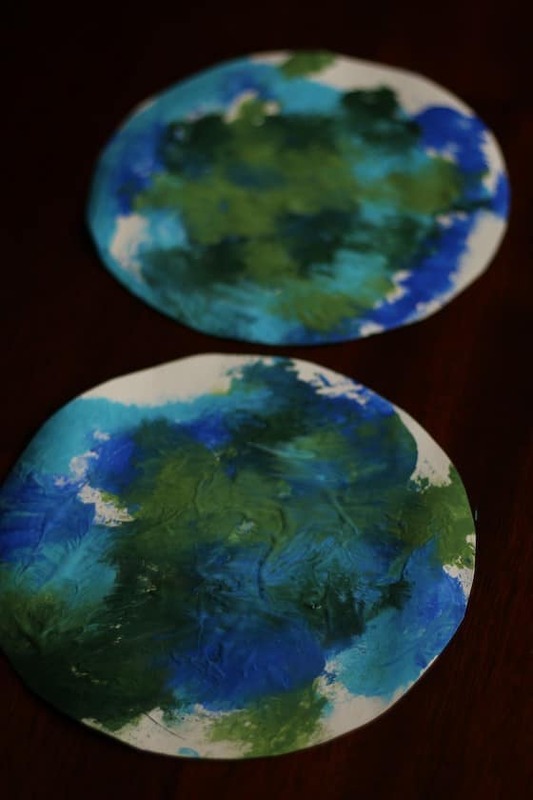 Place your painty cardboard circles into a plastic bag and press down to release any air in the bag. Have the kids press down all over the plastic bag, so the paint gets smooshed all over the surface of the cardboard inside. When the kids are happy with the amount of smooshing they’ve done, carefully open the bag up and remove your cardboard earth. Note: take care to not slide your project against the bag as you’re removing it or the paint will slide and smudge together. Don’t you think they really do look like the planet Earth?! We were so impressed with how well they turned out! how simple and sweet! They look great! Thanks, Bern! Glad you liked ’em! What a great idea to put it inside a plastic bag to smoosh it up!! Lovely craft! Your crafts are always so wonderful. I love getting my daily email from you. Thank you for all of the fun ideas. 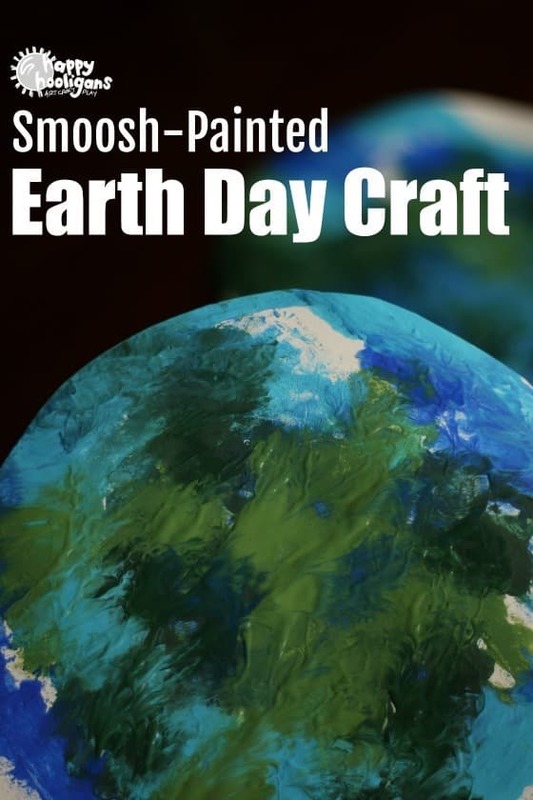 We will be doing earth day smoosh painting tomorrow! Oh, I love how it turned out. Such a great idea. What a great project! 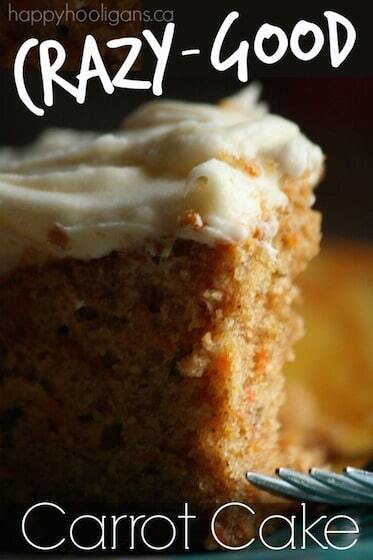 I think we will try this one-in honor of earth day. Thank You! I will let the toddlers have fun with this one. Thank You !